This Hide-A-Bar™ cabinet features paneled doors with inset panels of Ash Burl veneers in a parquet pattern framed with decorative moldings and oversized antique brass finished door knobs. Stores up to 22 bottles of wine, with a generous amount of room in the doors for liquor storage. An upper fixed shelf may hold glasses and tumblers. The cabinet is finished in Hampton Cherry with light distressing on select hardwoods and veneers. Wooden stemware racks. Front locking doors. The left door is secured with a slide lock on the upper interior. Auto-On™ light switch turns the light on as the left cabinet door is opened and off when closed. Is the width measurement with doors open or closed? BEST ANSWER: With the doors closed. But keep in mind the widest part of the cabinet is actually the top! That is where it is 43 inches wide. the main body of the cabinet is 38 inches (as I measured it just now). Hope this helps! How wide is the unit when the doors are opened 180 degrees? Can the wine dividers be removed to store more liquor bottles? BEST ANSWER: The wine dividers cannot be removed. If both doors are completely loaded with full liquor bottles, can both doors be open at the same time and extended forward from the unit without the entire unit falling forward on its face? BEST ANSWER: The Howard Miller Barossa Valley Wine & Bar Cabinet can have both doors open at the same time if they are full BUT the shelves should also be full to offset the weight in the doors. You can also adjust the legs in the front to help keep the cabinet from falling forward. BEST ANSWER: The Howard Miller Barossa Valley Wine and Bar Cabinet is ONLY available in the Hampton Cherry finish with light distressing on select hardwoods and veneers. What is the height of lower shelf above the wine storage area? Want to know if this is large enough to accommodate additional liquor bottles. BEST ANSWER: We do not export this product. However, you can make a purchase and ship to a U.S. freight forwarder of your choice and you would also handle the export and fees. This unit is in the formal living room and holds only the premium liqueurs from the collection. It is full. The doors remain locked. Day one the key broke off in the lock, had to get a second solid brass one. Still working months later. With doors fully loaded with full bottles, the door is hard to unlock. We are replacing the carpet with hard wood so that may be the fix to make certain doors are completely squared up. Door pulls are in center of each door vs. being closer to center of unit and it's really hard to open doors. So beautiful, substantial piece and 9 out of 10 on overall quality. If your collection uses 70% of the storage space, you will not have the issues we have. At 100% capacity, it is what it is. But what a good problem to have, yes? Too much collectible liqueur in a $2k liqueur cabinet...hmmm. puts it in perspective. Opening doors leaves guests with no words but oooooh and awwwwe. This was on the list for 3 years and it is everything we were hoping it would be. Glad we finally pulled the trigger. 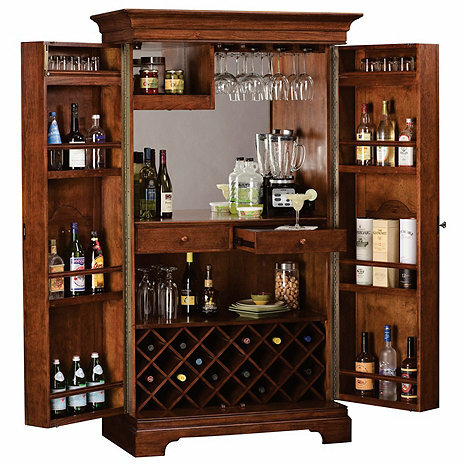 Holding plenty of alcohol and gadgets, this cabinet is a great choice for anyone who drinks regularly. Even if you don't, it looks so pretty sitting anywhere in the house. I purchased this cabinet one year ago and it still smells brand new. I decorate it for holidays and cleaning it is easy. I highly recommend this piece. If you like the way it looks on the site, buy it. I think I’m going to really like it, but it’s been a month and it still hasn’t arrived. Customer service hasn’t been helpful. Probably would have been better if they confirmed that I had it before soliciting a review. Loved it! Looks fantastic in my dining room. Would recommmend to anyone. Outstanding value - wonderful craftsmanship. Extremely satisfied.